Although the USS Niagara, or more commonly known as the US Brig Niagara is the ship on which Oliver Hazard Perry won the Battle of Lake Erie, it was actually an emergency substitute for his flagship, the USS Lawrence. Perry only transferred to the Niagara after it was obvious that the Lawrence was too badly damaged to continue the fight. After the battle had been won, Perry made a point of accepting the British surrender on board the recaptured Lawrence, in order to demonstrate to the British the price that had been paid for victory. When the War of 1812 ended in 1815, most of the ships that participated in the Battle of Lake Erie were sunk for preservation in Misery Bay on Presque Isle. The Niagara was kept afloat as a receiving ship for new recruits until 1820, when it was also scuttled after the closure of the naval base on Presque Isle. In April 1913, the Niagara was raised from Misery Bay for renovation and participation in the centennial celebration of the Battle of Lake Erie. The ship was given a new bowsprit, rigging and reconstruction cannons, and was towed to various ports for display from July to September 1913. Afterwards, the ship was given to the City of Erie and remained docked until it deteriorated. Ownership of the Niagara passed in 1929 to the USS Niagara Foundation, which had been formed for the express purpose of restoring the ship as the main exhibit of a museum. The commencement of the Great Depression made raising funds difficult, however. After several changes of ownership, the Niagara was finally restored by the Pennsylvania Historical and Museum Commission in time for the sesquicentennial of the Battle of Lake Erie in 1963. This restoration was considered incomplete, however, since little of the original ship remained and the restoration done in 1913 was not authentic to the period. In 1981, the Flagship Niagara League was given the task of rebuilding the Niagara as a working ship. Deterioration was so extensive that the ship was eventually taken apart and completely rebuilt with new timbers of seasoned yellow pine and Douglas fir, although several original timbers were preserved and incorporated into non-structural areas of the ship. The new Niagara was launched on September 10, 1988, 175 years to the day after the Battle of Lake Erie. 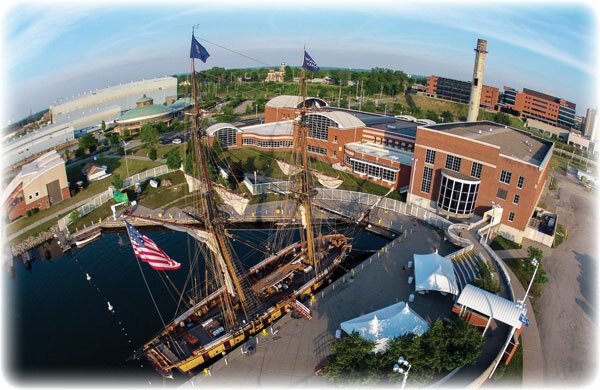 Today, the reconstructed US Brig Niagara (considered a reproduction of Perry’s relief flagship), is docked behind the Erie Maritime Museum in Erie, Pennsylvania as an outdoor exhibit. It also travels the Great Lakes during the summers as the official flagship and a “sailing ambassador” of the Commonwealth of Pennsylvania. 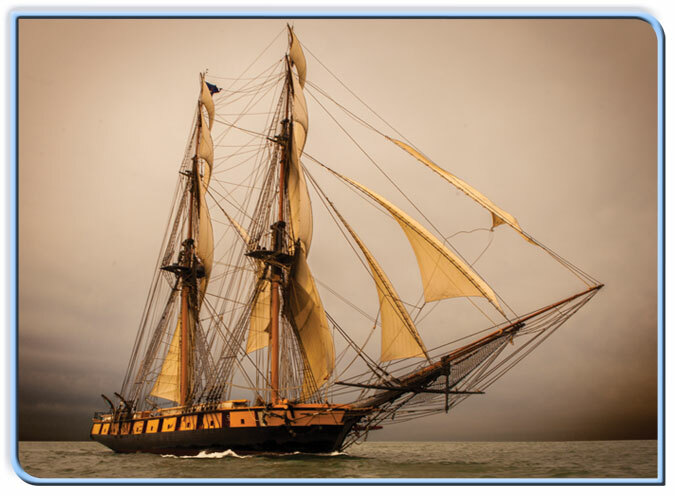 It is one of only two remaining ships from the War of 1812, along with the USS Constitution, and was listed on the National Register of Historic Places in 1973. Oliver Perry entered the Navy at the age of 13 as a midshipman and was assigned to his father’s frigate, the USS General Greene. He first saw combat in 1800 in the Caribbean during the Quasi-War with France. After serving in the First Barbary War, Perry was promoted to lieutenant and given his first command, a schooner called the USS Nautilus, at the age of 20. He then supervised the construction of a fleet of gunboats on the orders of President Thomas Jefferson, and was rewarded with the command of the 14-gun sloop USS Revenge. 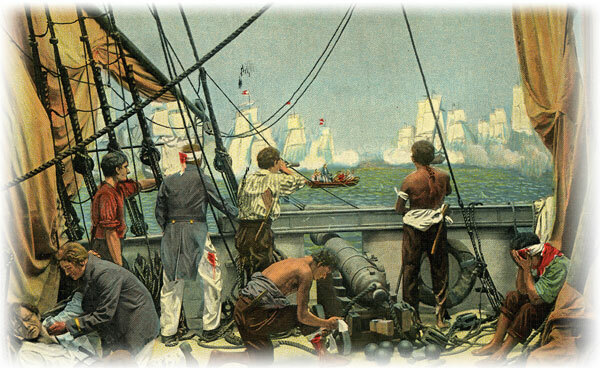 The Revenge conducted patrol duty to enforce the Embargo Act, and carried out a victorious raid to rescue an American ship that had been commandeered by the British in Spanish-held Florida. Unfortunately, the Revenge met an untimely end when it was wrecked on a reef off of Watch Hill, Rhode Island. The obligatory court-martial that was held afterwards cleared Perry of any responsibility for this loss, blaming fog and poor piloting instead. In fact, Perry was praised for his efforts to save the ship. After a leave of absence during which he took time to get married, Perry returned to active duty and was promoted to master-commandant. One month later, in June of 1812, the United States declared war on Great Britain because of its interference with American trade and shipping on the high seas. Perry was given command of a fleet of gunboats at Newport and New London, but apparently wanted to see more action and requested a transfer to the high seas or the Great Lakes. 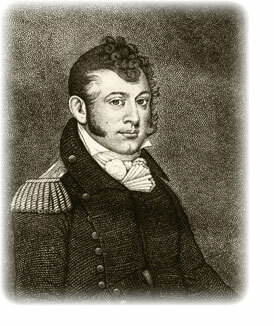 Perry was first sent to Commodore Isaac Chauncey’s command at Sackets Harbor, New York, on Lake Ontario. When no British attacks occurred, Perry was next sent to Erie, Pennsylvania to oversee the construction and command of a fleet on Presque Isle Bay to take Lake Erie back from the British. It was during this period at Erie that Perry adopted his personal battle flag, a large blue pennant with the words “DON’T GIVE UP THE SHIP” stitched in white. This was the dying command of his friend Captain James Lawrence, who had been killed in battle earlier in the year on June 4, 1813. So although Perry did not originate these legendary words, he immortalized them with his tribute to his dead colleague. As soon as war was declared, the British had immediately taken control of Lake Erie with a small convoy of ships already stationed there. This advantage led to the British victory at the Siege of Detroit, since they were able to use Lake Erie to transfer reinforcements to Amherstburg in Ontario, Canada. Both sides exchanged heavy fire. Perry’s flagship, the USS Lawrence (named after his deceased friend Captain James Lawrence), lost 80 percent of its crew and finally was too badly damaged to continue firing. While the Lawrence surrendered, Perry and four of his men secretly transferred to the USS Niagara, taking with them Perry’s battle flag that proclaimed “Don’t Give Up The Ship.” On board the Niagara, Perry took command of the ship, hoisted his flag and sailed under severe fire directly into the line of battle. Within 15 minutes, the Niagara had broken through the British line and, with the help of the rest of the American fleet, delivered broadsides that disabled the British force’s two largest ships, forcing them to surrender. This battle gave control of Lake Erie back to the Americans, enabling them to recapture Detroit and deny the British and their Indian allies access to supplies in the west. It also marked the first time that an entire British fleet surrendered and every captured ship was successfully brought back to base. Perry, at the age of 28, was a national hero. He went on to receive a Congressional Gold Medal, eventually be promoted to Commodore and serve in the Second Barbary War before dying prematurely at sea of yellow fever after a diplomatic mission to Venezuela, on his 34th birthday. This was not the first time that Erieites made a major point of celebrating the Niagara’s part in that historic battle. In Erie’s true festive fashion, the community has twice before held events in recognition of the iconic role that Erie took in the War of 1812. The first was the Centennial Victory Celebration of 1913 and the second, the Sesquicentennial Celebration, was in 1963. During the centennial, Erie celebrated with not one, but five parades honoring a variety of military, fraternal, and manufacturing organizations. The celebration concluded with the illumination of Perry Monument and a fireworks display. The sesquicentennial event, initiated with the presentation of “From The Shores” — a historical recreation of the Battle of Lake Erie, featured another fireworks display. This event also included a beard growing contest and the crowning of Miss Sesquicentennial. 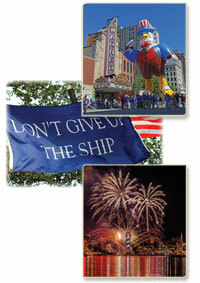 To celebrate the bicentennial, more than 80 entities came together, contributing $1.8 million. The commemoration brought vast appeal from each facet of the community. With the community’s overwhelming support, the celebration had to be broken down over the course of two seasons, 2012’s “Launch Season” and 2013’s “Sailing Season.” The “Launch Season” began on April 30, 2012, and included Perry 200 Commemoration events such as a lecture series, fireworks and historical tours. The “Sailing Season” included a Grand Patriotic Memorial Day Parade, SONS of Lake Erie Fishing Challenge, Erie Playhouse’s “Spirit of Erie,” a fireworks extravaganza, Erie Arts Festival, Aviation Gala, Perry Monument Tribute, a five-day Tall Ships Festival, Perry Burns Contest (sideburn growing), “Barber Beast on the Bay,” Erie Philharmonic concerts and more.